Aura – The year 1986 and AURA bids farewell to The Point After in the Hawaiian Regent Hotel, Waikiki. It is a bittersweet occasion. The Point After was the group’s home for the past 10 years. In December 1975 Stan Richards (Owner of the Point After Chain of clubs) walks into The Sting Night Club at the Princess Kaiulani Hotel, Waikiki. He discovers an off night band call themselves The Nomads. He was told they were a very good R&B band. Stan offered the band to perform in one of his sister’s Point After night clubs in Dallas Texas beginning January 1976. We played for two months before Stan cut the Dallas gig short to perform in the Honolulu Point After night club. A dream we always hoped would happen. Wayne Harada, entertainment local columnist of the Honolulu Advertiser writes this is history in the making…the first local act to play that room The group went on to receive numerous awards from Honolulu’s entertainment industry, year after year, for their superb talent & ability to “pack the room”. In 1978 Broad Recording Studio after hearing the group’s “disco” rendition of Kui Lee’s “I’ll Remember You” offered The Nomads an opportunity to record an album. In the process changes their name to AURA per advice of the producers. Aura recorded all original tunes except for their version of I’ll Remember You, Don Ho’s most popular tune. 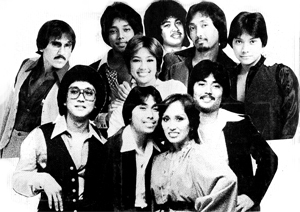 After their album released in 1979, Aura took a break & toured Asia for three months; upon completion they returned to Honolulu The Point After, where they remain until 1986. Later Aura also traveled to England for a recording project. Throughout the group’s entire history, one thing that stood out above all else that all eight members were siblings. The MENDOZA Family of Waipahu, Hawaii. All siblings started performing in their young teens. Over the years everyone decided to “settle down” & move on with various careers & have “reared” their children. Now since most of them are “empty nesters” all decided to get together, once again to perform for “fun”. The Family Band (AURA): Beverly Ann – Lead Vocals; Dennis Lee – Keyboardist, vocals; Brian Leo – Bassist, vocals; Del Patrick – Guitarist, vocals, instrumental arranging vocals & music; Christine Ellen – Vocals, percussionist; Clifton Scott – Trumpet, lead vocals, instrumental arranging vocals & music, Michael Keith – Trombone, lead vocals; Vincent Dominic – Drummer, Saxophonist, vocals, instrumental arranging music; Gerard Keevan Orbello (Nephew) – Lead vocals; Kristie Doss Ching (Niece) – Lead vocals. Our Hanai Brothers (Aura Members): Adney Atabay – Lead Vocals, Trumpet, percussionist; Bill Popaka – Saxophonist; Ed Maylock – Keyboardist. Of course like other groups the group went through several member changes over time. Without changes it would have been impossible for the group to evolve and become what it did. Including our cousins and extended ohana members, you all know who you are, each & everyone of you helped lay the foundation of the group’s success. Our deepest gratitude & love to all of you! MOM AND DAD: Needless to say, we would never have been what/who we are if it had not been for our parents, Agnes Aiko & Julian B (Joe) Mendoza. We owe them a debt of gratitude for their unrelenting support & unconditional love. They accompanied us to every gig. They became Mom & Dad to everyone who frequent the club scene. They were one of our biggest fans. It was so comforting to see them watching over us. We lost our dad Joe in 1981. Mom is still here with us, bless her heart. She resides in a nursing home with progressive Dementia. She is a true matriarch of the family. We dedicate our performance tonight August 5, 2017 to our mother Agnes. We love you so much mom. Thank you for still hanging in there with us! In Closing…we’d like to thank everyone who made it possible for the The Nomads & AURA to enjoy & become a part to the excitement and success in the 70’s music scene in Waikiki. We will be forever grateful & everyone of you who supported us & our music…without you it would never have been as wonderful as it was. Beverly Ann – Started performing for audiences at age 12. At age 14, while performing on a local television program, a professional jazz group (who also performed that day), asked her Dad, Julian B. Mendoza, if he would consider allowing her to perform with them at the Officer’s Club located on various military bases on Oahu. Dad and Mom, Agnes Cuaresma Mendoza, approved and accompanied her to all of the engagements. Over the course of the years , she was asked to perform/record with a concert act (wanted her to return to the mainland with them to record when she was only 15) as well as a number of local artists; needless to say, she always refused preferring to perform with her family. Today, Beverly is involved in the real estate business. Dennis Lee – Started performing for audiences by accompanying Bev on ukulele at age 11. When the Beatles hit the music scene, everyone wanted to play in a band and Dad realized his boys were no different. Dad went out, purchased a guitar for Dennis and showed him the basics. Of course, Dennis went on to expand on what he learned from Dad & formed himself a “band”. He entered the Air Force after graduating from high school and was discharged with the rank of Staff Sergeant; upon his return, Dad told him the band needed a “keyboardist”…and so, he learned to play the keyboards and does so to this day. Now you talk about being multi-talented, not only did he sing lead and parts but would play 2 sets of keyboards simultaneously! Today, Dennis is a certified elevator mechanic. Brian Leo – Started performing for audiences on base at the age of 11. When Dad purchased a guitar for Dennis, he also purchased a bass guitar for Brian; Brian, however, really wanted to play the drums. Dad insisted he play bass guitar because that’s what the “band” needed…and so he did…and does to this day. He has been hailed as the hottest bassist in the islands and is well respected as such by his peers. Today, Brian is with Sears Distribution Center. Del Patrick – Started performing for audiences at the age of 10 on guitar. He is the family’s “musical genius”. As the group evolved, Del arranged all of the instrumental and vocal parts for every song he band performed…and still does to this day. He has long been admired and respected by local musicians for his musical “stylings” on guitar and as if that is not enough, he also has a beautiful voice to boot! Today, Del is in the auto mechanic business. Christine Ellen – Started performing for audiences at the age of 12. Not only does she have a fantastic voice but is awesome on the congas! She is admired and respected by many of her male counterparts for her ability and rhythmic “stylings” on congas. It’s hard to believe that this “pint sized” person (she’s only 4’11”) can put out so much! Today, Christine is with Mitsubishi Elevator Co. and has been with the elevator trade for the last 14 years. Clifton Scott – Started performing for audiences at the age of 16. After studying with an instructor, he mastered the trumpet by age 15 and by the time he entered the group, they were in dire need of a mean brass section because the popular music of the day called for it. He not only plays a “hot” trumpet but has a fantastic voice as well! Today, Clifton is with the City and County of California’s Courier Dept. Michael Keith – Started performing for audiences at the age of 15. He also studied with the same instructor Clifton did and mastered the trombone by age 14. While he played a “mean” trombone little did anyone know that he was also gifted with an amazing voice! He soon became the lead vocalist of the group. Also being multi-talented, Michael plays guitar, bass & keyboards when called upon. Today, he is in the trucking business and has been a “trucker” for several years now in Las Vegas. He and Vincent also put together a band called “Phixation” and have started working the Casino Stations. Vincent Dominic – Started performing for audiences at the age of 12. He is the youngest sibling and the family’s second “musical genius”. He mastered the saxophone by age 12 but by the time he was ready to enter the group, Dad told him the band needed a drummer…so he learned to play the drums and continues to be the “hottest” drummer and saxophonist in any town! Did I mention “genius”? He also arranges music, plays keyboards and has a great voice! Up until recently, he performed with the Society of Seven. He is currently with the Culinary Union in Las Vegas and performs with Michael and their band “Phixation”. Gerard Keevan (Bev’s Son)– Started singing at the age of 2. He performed dinner music, for the Society Seven, at the Outrigger Main Showroom until it was discontinued in October 2002. He learned to play classical piano at the age of 10 and also has a beautiful, rich and soulful voice so he just fit right in with his mom, aunty and uncles! He’s a graduate of Iolani School (1996) and has his B.A. and Masters in Business Admin/Marketing. He is currently the Asst. Area Director, in charge of Dept. Operations, for the Landry Corporation (owner of the Golden Nugget in Las Vegas). Adney Atabay – Adney is more like our 7th brother. He lived just down the street from us and hung out with Michael and Clifton since they were “keikis”. He also studied with the same instructor Clifton, Michael ands Vincent did and mastered the trumpet by age 14. He started performing for audiences by age 15 and together he, Clifton and Michael, became part of AURA’s formidable brass section. Adney is still involved with Hawaii’s music scene and performs for various venues in the islands. Bill Popaka – Just when AURA needed a “hot” saxophonist, in walks Bill Popaka. Bill is an absolute professional who played with several well known local acts prior to performing with AURA (Carol Kai, etc.). Today, he is with the U.S. Postal Service but still performs with various local acts when he is called upon.